As its potential to improve outcomes and quality of care while also curbing costs becomes more and more apparent, the use of telehealth has become increasingly embraced by a diverse array of organizations nationwide — from healthcare systems and hospitals to state governments and major universities. Among the organizations reporting early success with telehealth has been the state of Mississippi. 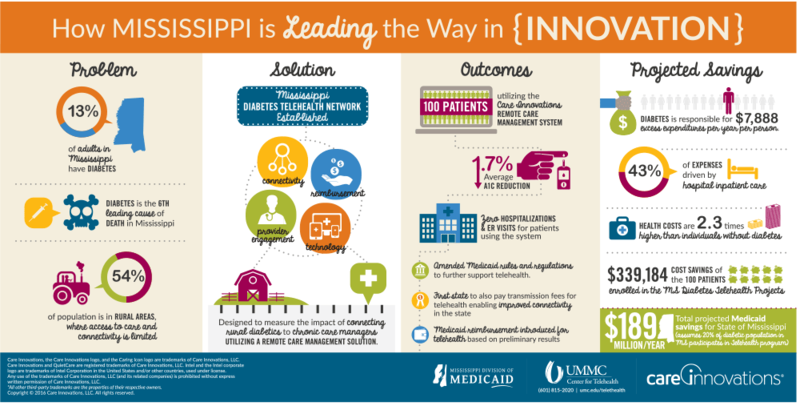 Indeed, the Mississippi Diabetes Telehealth Network — powered by Care Innovations® Health Harmony remote patient management (RPM) platform — is widely viewed as a watershed success story. Thanks to the diabetes telehealth network, “Mississippi leads the nation in telemedicine and is one of only seven states to receive an ‘A’ rating from the American Telemedicine Association,” the state’s governor Phil Bryant has written in an editorial for Jackson’s Clarion-Ledger. More specifically, the diabetes telehealth program “saved roughly $400,000, reduced A1C levels by 1.7 percent and saw no ER visits or hospitalizations among the 100 residents involved in the initial six-month pilot,” according to a news release from the North Sunflower Medical Center. Given the success of the Mississippi Diabetes Telehealth Network’s pilot program, it didn’t take long for program leaders to announce a five-year extension — again spearheaded by Care Innovations technology. “After seeing the success derived through our diabetes program with Care Innovations and the improvement in quality of life it provided for those enrolled, we are ready to extend the benefits to other chronically ill populations and healthcare organizations who share our vision of a healthcare system that extends into the home,” Kevin Cook, UMMC’s CEO of University Hospitals and Health System, said in a news release. “By extending this program, we expect to save $189 million in Medicaid each year just with the diabetic population,” he added. So confident is the state in its mission to expand its telehealth success, that the new program will involve hiring additional staff members and even adding a new facility, reports mHealthIntelligence. And, once again, Care Innovations will be a key partner in Mississippi’s telehealth efforts. “Because we started with a patient population facing the most difficult challenges, we are extremely confident we will continue to be successful as we expand the program to other chronic conditions,” she added. In the same ceremony, Dr. Henderson talks about how the telehealth services helps to meet these challenges by expanding patients’ access to care and improving patient engagement. “Beyond improved clinical outcomes, reduced travel, and avoided readmissions, there are the intangibles of empowering patients to take control of their own care, as well,” points out the American Journal of Managed Care in an analysis of the telehealth network. Learn more about how telehealth programs like the Care Innovations Health Harmony platform — the basis for the Mississippi Diabetes Telehealth Network — can help healthcare organizations improve care while reducing costs: Contact a Care Innovations representative for more information.